When I woke up last Monday morning I didn't anticipate that I would be spending the evening with Michael McIntyre in a converted Victorian Bathhouse somewhere near Liverpool Street. It wasn’t THAT Michael McIntyre. This Michael McIntyre happens to be a magician sharing the same name with the comedian. 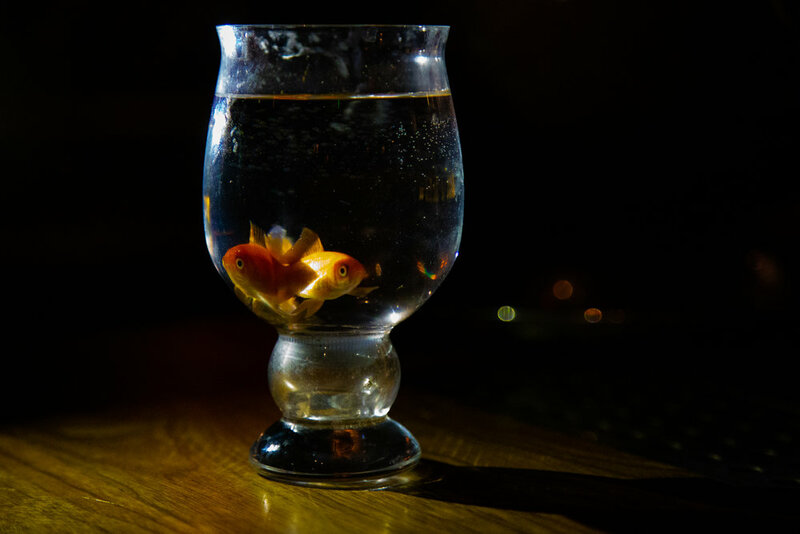 Michael, along with fellow magician Jack Lenoir accompanied by Jack’s two goldfish Charles and Darwin had been hired to entertain guests with close-up magic that evening. A tip, they told me, is to try to capture the expressions of the guests, especially at that ‘ta dahhh’ moment. And so I tried. I captured. I saw suspicion, curiosity, amazement, and befuddlement. Often all in the same photo. Occasionally I ducked out of the reception to take refuge behind a red velvet curtain where trays of champagne glasses were being refilled. I sighed. I stuck with the water. I’m a talker like my dad, consequently striking up conversations with the friendly waiting staff tasked with refill duty responsibilities. Turns out that they are singers and dancers, other people in pursuit of their passions. Several conversations began, yet remained unfinished because we were all so busy. But it was fun, although they all looked a little uneasy as they watched me balance precariously on a wobbly stool behind the bar, dangerously close to meticulously arranged glassware as I attempted to take a big group shot of the guests. Nobody likes to be photographed with a mouthful of mangetout. So, as the guests tuck into their meals I took a proper break. The magicians saw this as an opportunity to exchange secrets of their magical prowess and to practice new tricks. It didn’t matter how hard I looked, I couldn’t work out how on earth they did anything. Later that week I am editing and my doorbell buzzes. I am expecting a visit any time between 8 am – 12 noon by someone coming to check the safety of the electricity meter. The guy was apologetic as I let him in – not a problem, I said. He noticed my piano and asked if I am a musician. I’m really not. Wayne, as it turns out in an electricity meter safety checker by day, and a musician, a podcaster, and a radio show host night. We chat about Prince, recalling the times when we’d seen him perform. Wayne was scheduled to interview a member of The Revolution (the band that played with Prince in the 80s) later that day. He scribbled down his podcast details – something else to listen to when editing. And my electricity meter was perfectly healthy. In the space of 48 hours, I had met a ton of people making it work to be able to do the stuff that they love. It was energising and I'm still thinking about it. It was that thing; never knowing where photography is going to take you and who you might meet along the way. It’s only 11am. It feels like 2pm. I am staying with friends who have two young children and a cat called Noodle, and this requires a shift into a different time use mindset. The household mobilises early (by my current standards) meaning that just after breakfast I had already been recruited to an air clay animal production team. I was quietly pleased with my efforts, my ad-lib whale in particular. Noodle manoeuvered into the lounge each morning where I would be half asleep on the sofa bed. There would be a ‘brrrrp’ as he jumped up, a ‘pad pad pad’ as he crept up the duvet, followed by a massive ‘purrrrrr’ and a wet nose in my face. When I was little, I would often wish for one of our family pet cats to sneak into my bedroom and sleep on my bed all night. That never happened – it wasn’t allowed, although the cats were totally spoiled and loved. If I ever have a cat, it will be allowed to sleep on my bed. All night. My train didn’t leave until late afternoon on my last day, meaning that there was a window for a coastal walk that morning. Before I had left London, my friends had asked me, in the nicest possible way, if I had any practical footwear, or a coat suitable for South Devon climates…I didn’t. I felt slightly more prepared after I purchased a pair of pseudo practical boots in H&M in anticipation of the elements. The boots survived the pouring rain and the squelchiest of muddy walks through Dartington estate, a trip to the beach where the tide came gushing in so fast that it flooded my boots and I only just about dodged trench foot. Undefeated, they conquered the ups and downs of the coastal path that last day. 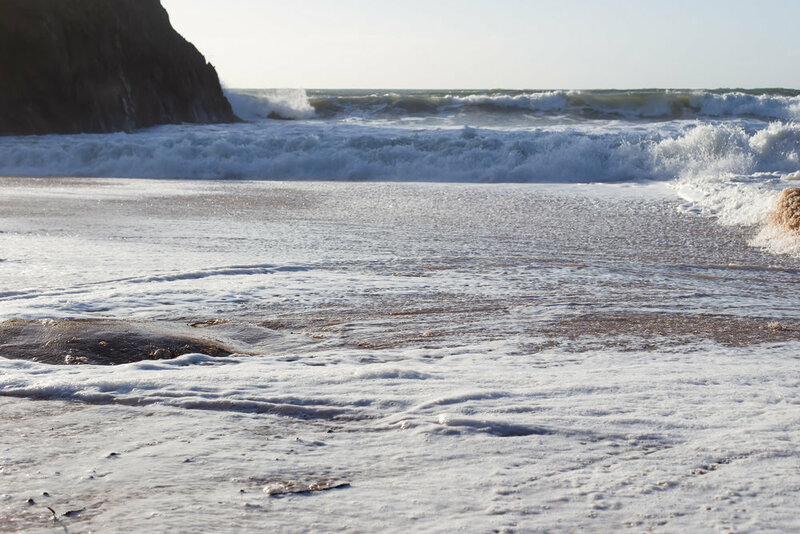 Hope Cove….where I nearly became a trench foot victim…. We were still in the van on the way to the coast when we heard the news that Karl Lagerfeld had died. The man with the sunglasses and the white ponytail. We lingered over this topic for a while, wondering how we were supposed to feel. We never really concluded that one, but instead it got us talking about the things that are important to us. This conversation continued after we’d parked. It is hard to resist the feel-good factor triggered by a gloriously sunny day in winter. The sea stretched out in front of us and the spectacular jagged granite rocks loomed above. We perched carefully on the edge of the path to eat sausage rolls and cheese sandwiches, watching an excited small dog chase a frantic sheep through the gorse. I felt lucky to be there, grateful for good friends and the breathtaking views, relieved that the sheep didn’t plummet over the cliff edge, and surprised by the durability of my boots.